Do more than just print - scan and copy too with this reliable and easy-to-use all-in-one. Print documents, web pages and photos. 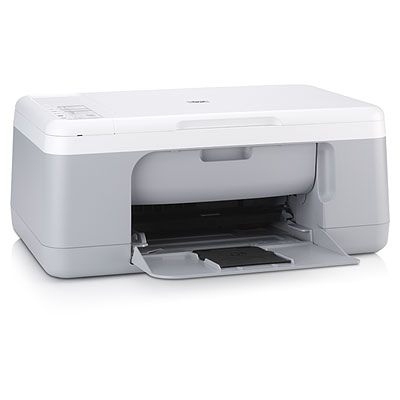 Make quick colour copies and turn photos and paperwork into digital files with the built-in scanner. Compact all-in-one designed for easy set-up and intuitive, affordable operation. Borderless 10 x 15 cm (with tear-off tab), up to A4 with borders. 4-ink colour with up to 4800-optimised dpi; optional 6-ink colour and high-capacity cartridges. 80-sheet fold-up tray. Flatbed scanning with 1200 x 2400 dpi scan resolution, 48-bit colour. HP Smart Web Printing, one-touch print-cancel button. Print/copy up to 20 ppm black, 14 ppm colour. Mac OS X v10.3.9, v10.4, v10.5 or higher; Microsoft Windows 2000 Professional (SP4), XP Home (SP1), XP Professional, XP Professional x64, 2000 and XP x64 are supported with a print driver only; Windows Vista. HP Smart Web Printing and HP Photosmart Essential Software applications are not available for Microsoft Windows 2000, XP x64 or Mac OS X.